1-2 Larcopyle ? sp. ; 1, VS-R-71a, 1-3cm, O43/3, 300x; 2, VS-R-60b, 3-5cm, U13/1, 300x. 3-5 Larcopyle bütschlii Dreyer; 3, outer shell incompletely developed, VS-R-81a, 1-3cm, D51/0, 300x; 4, (? ), VS-R-71a, 1-3cm, E8/2, 300x; 5, VS-R-92b, 1-3cm, T38/3, 300x. 6-8 Spumellina incertae sedis Forma A; 6, focus on surface, VS-R-90Ba, 1-3cm, L46/4, 300x; 7, same as figure 6, focus on periphery, 300x; 8, broken specimen showing the inner radial tubules, VS-R-90Ba, 1-3cm, O48/0, 300x. 9-11 Spumellina incertae sedis Forma B; 9, focus on surface, sulcus to right, VS-R-90Ba, 1-3cm, J39/2, 300x; 10, same as figure 9, focus on periphery, 300x; 11, focus on sulcus, VS-R-90Ba, 1-3cm, M17/0, 300x. 12-13 Plagonium cf. 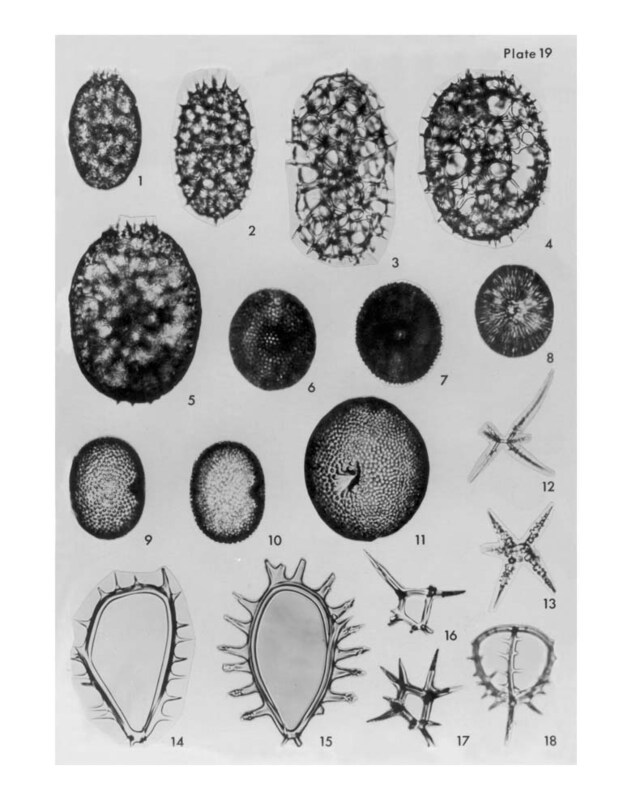 sphaerozoum Haeckel; 12, VS-R-93b, 1-3cm, T11/4, 300x; 13, VS-R-151a, 1-3cm, B44/0, 300x. 14-15 Zygocircus productus (Hertwig) Bütschli; 14, left lateral view, VS-R-81a, 1-3cm, D31/5, 300x; 15, right lateral view, VS-R-71a, 1-3cm, O21/0, 300x. 16-17 Zygocircus sp. ; 16, left lateral view, VS-R-93b, 1-3cm, W17/4, 300x; 17, left lateral view, VS-R-133b, 1-3cm, N36/0, 300x. 18 Neosemantis distephanus (Haeckel) Popofsky; dorsal view, VS-R-92b, 1-3cm, C15/1, 300x.